This is a fully furnished 3 bedroom 2 bathroom home sitting on a quarter acre in park like setting 3 blocks from the sandy beach of Skaha lake in a quiet residential area. There is also ample parking for your car, boat or RV. This is a non-smoking home which offers central air conditioning, ceiling fans, thermal windows with screens, fire place, LCD Television with DVD, cable and high speed internet. The kitchen is fully stocked with all dinnerware and cooking supplies, stainless steel appliances, extra large fridge with ice maker and a water filtration system. It also has a gas stove, hood fan, microwave, dishwasher, toaster, coffee maker and a water kettle. Other amenities include high chair, play pen, excersaucer, umbrella stroller, wagon, vacuum, iron and on site laundry machine. The living room is tastefully decorated with hardwood floors, wood window coverings, remote control fireplace, two sofa beds, coffee tables, sitting bench, lamps, TV, DVD, cable vision and high speed internet. There is a indoor eating area which has a large table that seats 8 comfortably. One bedroom has a queen sized bed with dresser, lamp, storage area and closet. The other two bedrooms have double over double bunk beds in each room and also have lamps, storage area, dressers and closets. The outdoor features a child friendly private yard that is neatly kept and enclosed with a cedar fence with gates. There are also two picnic tables and a natural gas BBQ grill on hand for outdoor lunch, dinner and BBQ. This home has been specifically designed for sharing families wanting to create lasting memories in the minds of their children. If you have any other inquiries please do not hesitate to call or email me. Thank you, Joe and Angela. Had a great time staying at your home. Very comfortable house and a great backyard. We had lots of fun playing with our grandkids in the yard. The house was close to Skaha lake which was wonderful as it was easy to get to the beach. Thanks Joe and Angela had a great time. 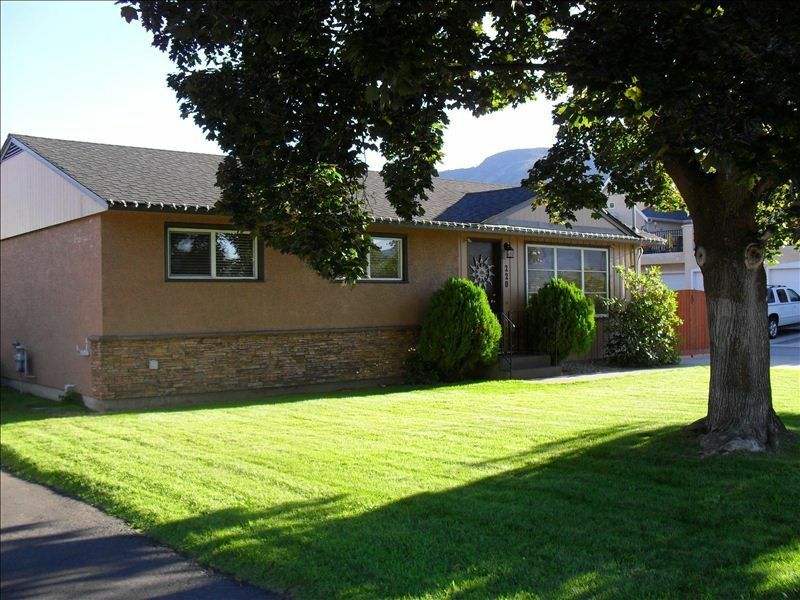 Beautiful home with giant yard and wonderful location so convenient to Skaha lake and shopping. This was a very cozy, comfortable home perfect for our young family especially with all the backyard toys and baby accessories. The owners were very friendly and helpful and we had a wonderful vacation here! Great house, great owners and fantastic location! We just returned from a fantastic week in Penticton. This home was clean, spacious and had everything that we needed. Nicely air conditioned! Steps to Skaha lake and a great backyard with lots of room to run around and a nice outside play area for the kids. Joe was fantastic at making us feel welcomed! We look forward to returning to this Penticton home again! Thank you for staying with us!!! This is a perfect vacation home for families with kids! The home was very clean and well taken care of. The backyard was perfect for the kids with a swing set and all fenced it. The location was perfect and only a few minutes from the beach and park. We absolutely loved it and plan to book it again for next year. Awesome location and accomodation in the best part of Penticton! Very nice home! Extremely close to everything Skaha lake has to offer! Great yard for outdoor games & relaxation. Located in the heart of wine country and in the middle of the two most beautiful pristine lakes in British Columbia. Famous for the best summer climate in Canada allowing for world famous wines and fun in the sun.